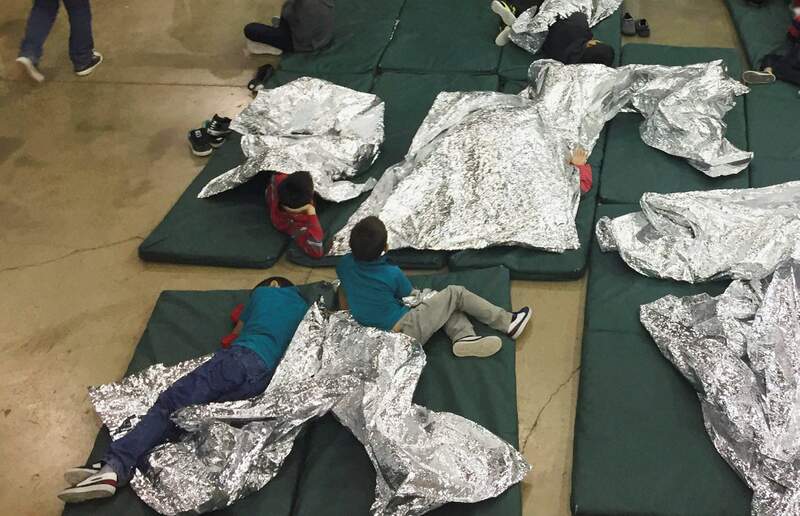 On June 17, 2018, people who have been taken into custody related to cases of illegal entry into the United States, rest in one of the cages at a facility in McAllen, Texas. Harvard University neuroscientist Charles Nelson says Central-American children arriving with their families at the southern U.S. border have already endured the trauma of leaving their homes, some after violence or other threats, and faced the additional trauma of an arduous journey north. “That may increase their susceptibility to the hazards of separation at the border,” he says. CHICAGO – Doctors have long known that separating families and other traumatic events can damage children’s well-being. More recent research has shed some light on how that may happen: Severe early adversity may cause brain changes and “toxic stress,” resulting in lasting psychological and physical health problems. A “zero-tolerance” immigration policy announced this spring by the Trump Administration has separated 2,300 children from the adults they were traveling with and sent them to shelters and foster homes across the country, according to the government. The administration has 30 days to reunite families, but it remains unclear whether it can meet that deadline. Here’s what evidence shows this kind of separation can do and how some experts think immigrant children may be at risk. The stress responseStress is a normal response to challenging or threatening circumstances that cause the brain to trigger the body’s “fight or flight” mode. Stress hormones and chemicals are released that increase heart rate, blood pressure, alertness and energy levels. Levels typically return to normal when the threat passes. When the threat is ongoing – a result of things like war, famine, poverty, natural disasters, family discord or neighborhood violence – the stress system may remain on high alert, sometimes triggering anxiety, behavior problems, stomach aches, sleep problems and other mental and physical symptoms. Experts believe that contact with a loving, nurturing parent or caregiver can help children weather stress and reduce chances for lasting ill effects. A recent U.S. study of toddlers from families living in poverty is an example. Youngsters who had a strong parent relationship had lower stress-hormone levels when they arrived at a clinic to get vaccinations than those without that parent buffer. What’s toxic stress?Scientists increasingly believe that persistent stress, particularly when there’s no nurturing parent to help kids cope, can cause stress hormones and internal inflammatory markers to smolder at elevated levels, raising risks for later heart disease, diabetes and other health problems. The science is not settled, but some studies also have shown that persistent stress may alter brain structure in regions affecting emotions and regulating behavior. Imaging studies have found these regions are smaller than usual in severely traumatized children. Harvard University neuroscientist Charles Nelson says children younger than 3, with rapidly developing brains, are most at risk for the toxic effects of ongoing stress. In his imaging studies, school-aged Romanian orphans sent to live with foster families had brains with less gray matter than orphans sent to nurturing foster homes before age 2. What about migrant children?Central American children arriving with their families at the southern U.S. border have already endured the trauma of leaving their homes, some after violence or other threats, and faced the additional trauma of an arduous journey north, Nelson said Wednesday. “That may increase their susceptibility to the hazards of separation at the border,” he said. “This is what science has taught us about separation,” he said Wednesday. The academy and several mental health groups recently denounced the separation policy and cautiously supported last week’s executive order to overturn it. Tuesday’s order from a federal judge mandating that thousands of families be reunited within 30 days is an important step, the academy said in a joint statement with UNICEF USA, but it won’t undo the trauma separated children have already faced, said Academy President Dr. Colleen Kraft. Even if they are eventually reunited, these families will need “trauma-informed” care to help them cope, Kraft said. Kraft attempted to enter a children’s shelter in McAllen, Texas on Wednesday to see what attempts were being made to reunite children and parents but said authorities turned her away. During an April visit to the same shelter, Kraft saw children who were “eerily quiet” and one who was crying inconsolably while attendants watched. “Staff in the room were not allowed to pick her up and hold her,” Kraft said. It’s that kind of absence of nurturing contact that experts think worsens the effects of traumatic stress. Follow AP Medical Writer Lindsey Tanner on Twitter at @LindseyTanner. Her work can be found here .